This is a given name and surname most likely derived from the Biblical figure Noah (Hebrew: Nôach), meaning "rest." The English form Noah became common among the Puritans after the Protestant Reformation. Noah was the tenth and last of the antediluvian Patriarchs. The story of Noah and the ark is told in chapters 6–9 of the book of Genesis, and also said in chapter 71 of the Quran. The Biblical account is followed by the story of the Curse of Ham. 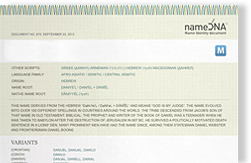 Outside of Genesis, his name is mentioned in Ezekiel, Isaiah, and Chronicles. He was the subject of much elaboration in later Abrahamic traditions, including the Qur'an). According to the Book of Mormon, King Noah was a wicked monarch best known for burning the prophet Abinadi at stake. It is said that King Noah, described in the Book of Mosiah, presided over an evil kingdom led by false priests. Noah succeeded to his father Zeniff and his son Limhi.